Wix.com is an Israel company, Israel companies make 200 Billion dollars a year for Israel. Wix.com is one to tricking people by giving free sample websites to people and then tell them if they want the features, they have to pay outrages fees! 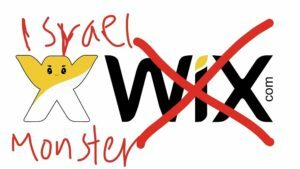 Wix.com is a Scam, wix.com is an Israel company helping to make 200 Billion dollars a year for Israel. Wix.com tricks people by giving out a free website but then once you have wasted weeks on designing it, they tell you, you have to pay for this feature and this feature and buy this hosting plan. Their prices are outrages and what you don’t get told because of all wix adverts is you can get a professional website done for just $5 a month at many other hosting and webdesign companies, that aren’t supporting a Zionist regime. 6G & 5G Firewall Protection?